Stings doesn't it, Ranger brethren. 2 nights a row we were shut out by Brodeurs, first by the flopper and now by an AHL goalie in his second NHL game. While many of us took solace in the effort we put forth against the division/conference leading devils. 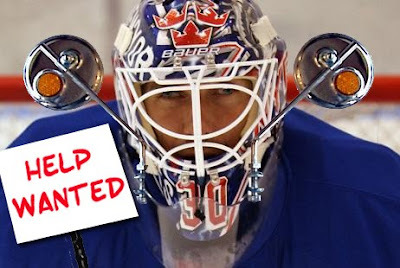 (and truth be told.... niether goalie deserved to lose that game... ok maybe Marty did because he's a bit of whining d**che.. but anyway I digress.) Either way, from a night where the fans of this team could settle for the point from getting to overtime and the self satisfaction that came with hard work... Last night was a rude awakening and the Ottawa Senators came to town to tell us that our best wasn't good enough. Facing a team that was three points behind us in the standings, we failed to show... and rightfully at the end of the first we should of and could have been down 4-0 if not for the specatcular play of Henrik Lunqvist, who grew eyes in the back of his head and had a full time job just keeping himself aware of the presence of former Ranger, Alex Kovalev. Perhaps we were just worn out from all that work we did against Jersey... but more over, my logic and history as a Ranger fan, tells me that this team was riding high on the effort... and stumbled into an ambush last night as we prepared to face an Ottawa team that was in the midst of a losing streak and 3 points behind us in the standings. I'm not accusing any of this team with being happy with a loss, but I know if theres one thing that tends to be more consistent on my team, more than anything else, it's playing up or down to the level of competition. We can beat the best of the league on one night and lose to the worst the next. Perhaps it would be best if we kept the schedule a mystery to the team so they would have to prepare for the worst case scenario all the time. Yes the tone was set early in the first, kiddies. As our saving grace in net gave coach Torts enough time to call one of those early time outs to attempt to right the ship.. Tortorella, probably 2 steps from the looney bin after watching the horror unfold in front of him, probably let out a nice.. "WTF?!?!?" and let everyone gathered around the bench, absorb it and take a moment for a self reflection. Really, what else could be said at that point? Even the most elementary of observations would have been helpful, yet so comical. "Get the puck" ... "Hit back" ... "stop turning it over" or maybe just a simple "TRY HARDER!" Yes in fact, if I had to choose a theme of the night and of the lesson learned from last night's demoralizing brutality... It would be try harder. Because sometimes your best isn't enough. (no matter how many times its claimed and blurted into microphones around the lockeroom after losses like last nights tha the team did it's best.). I can't begin to even speak about the 2nd and 3rd period, though we did seem considerably more concious in the final stanza of the game. I could be guilty of jixing us with remark to the other dark writers about the assignment of covering the game and the all heartstopping moment that occurs whenever Kovalev makes a return to the garden, gets the puck on his stick and we scream NOOOOOOO! in slow motion. I strangely get the feeling though that I am not alone in that sentiment and if its something you were thinking too, its just as much your fault as it is mine. I know it hurts. I feel the pain as well. Maybe you could alleviate my pain by preforming a link exchange with me! 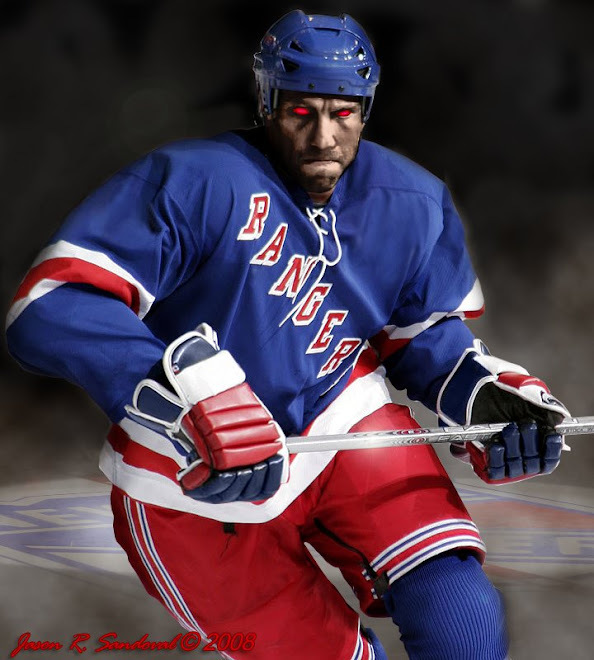 I'm Frank with Blueshirt Dirt: A New York Rangers Blog. I've added you to my blogroll and hope you can do the same for me! Thanks!